How Much Do We Really Spend? Most of what we read about marketing is about how to make the most of social networks or how to optimize something. While staying current with technology and using available resources to connect with your customers is very important, most marketers still are not spending a majority of their advertising budgets online, even if your reading tells you a different story. Marketing Experiments shared some data published by Forrester Research that showed. Looking into the future, offline and traditional media, including direct mail, will still be a very important part of marketing strategy. On November 2, 2010 we the people are going to elect 36 U.S. Senators, all 435 House of Representatives and 37 governors. During the coming days, many political candidates and interested parties will use direct mail because it is effective. The USPS offers special services and some processing differences for political endorsements. Depending on the circumstances, the message may qualify for Standard Mail and/or Nonprofit Standard Mail prices. The USPS offers this information for those who wish to use a special designation to facilitate processing of political mail. “Any material mailed as First-Class Mail or Standard Mail for political campaign purposes by a registered political candidate, campaign committee or committee of a political party is classified as a “political campaign mailing.” An individual or organization recognized as such by the appropriate government (national, state, local) election control authority is considered to be a registered political candidate or party. Political campaign mailings are identified and documented when deposited at Post Office acceptance units prior to entry into processing and distribution. Using a red “Tag 57, Political Campaign Mailing”, aids the Post Office in identifying the political campaign mailings. First-Class Mail and Standard Mail entered by a registered political candidate, campaign committee or committee of a political party can be identified by using “Tag 57” on the mailing containers. Use of “Tag 57” with eligible campaign mailings is optional. We strive to offer our experience and expertise to our customers to help them take advantage of every possible discount the USPS offers. BNET posted an article in its leadership section titled, “What to Do in a Double-Dip Recession? Grow!” This may sound counter intuitive but it isn’t. There is evidence and research everywhere to support the notion that if you invest in gaining market share when your competitors are just trying to hang on, you will be in much better position when things do turn around. We published these tips about Marketing in Tough Times a few years ago, they still seem very relevant today. The Harvard Business Review offers great short tips in its “Management Tip of The Day”. These were offered as tips for new fragile ventures. They suggested that knowing these three things would help to manage through this precarious time. How many days you have to live? Businesses fail because they run out of cash. Knowing exactly how many months or days you have to live can help you better manage costs and your funding strategy. Why you are doing this. Success requires hard work and constant attention. If you don’t know exactly why you should make the effort, neither will your funders. The top two critical issues. Be precise about which two issues deserve the highest priority. These may not be the most urgent, but are the ones that matter most to your venture’s success. The graphic from the previous post about Word of Mouth showed that advertising, including direct mail, is the most important factor of consumer purchasing decisions during the “initial consideration” phase of the purchase decision making process. 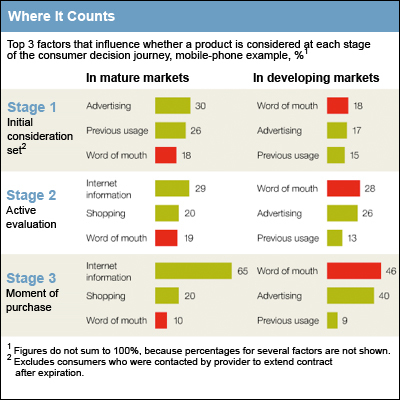 Consumers “pull” information to them later in the purchase decision process. How can we help you use direct mail to help you build your brand or stimulate demand? Word of mouth is the primary factor behind 20 to 50 percent of all purchasing decisions. The power of word of mouth is greatest when consumers are buying a product for the first time or when products are relatively expensive, these factors tend to make people conduct more research, seek more trusted opinions, and take longer to think about purchases. The Harvard Business Review summarized research from the McKinsey Quarterly that indicates that in developed markets, word of mouth has its biggest impact when consumers decide which products to consider and when they’re actively evaluating products. BNET featured a post titled “No Budget? No Problem. How to Do More with Less.” The post highlighted an interview with adjunct professor at the Yale School of Management, Nancy Lublin. She retold a story about a time that President Lyndon Johnson visited NASA headquarters. While there, the President had a brief conversation with a custodian, who said, “I helped put a man on the moon.” Ms. Lublin suggested that organizations that want to create that same feeling in employees not underestimate the power of believing in something. She suggested that corporate goals be tied to whatever your company does best, whether it makes the fastest, cheapest, or the only product or service of its kind. Is it time to solidify those great feelings about what your company does best with a direct mail piece? An ergonomics study at Cornell University found that warm workers work better, chilly workers made more errors. When the office temperature increased from 68 to 77 degrees Fahrenheit, typing errors fell by 44 percent and typing output jumped 150 percent. This strategy makes sense especially this summer as we all are trying to save wherever we can. Can we show you how we use this sensibility to help you save every possible cent on your direct marketing too. DMNews posted an article about how customer loyalty practices can build brands. American businesses that have the strongest bottom lines right now are those that enjoy the strongest brand loyalty. More and more organizations are searching ways to gain visibility for and engagement with their brands. Marketers have always known the value of brand building. Once consumers begin to trust a brand, their loyalty to it grows – and loyal customers have far higher long-term value than opportunistic customers. Consumers have shown that they will defect from brands that bombard them with impersonal and irrelevant information. However, they are more likely to make a purchase after a personalized interaction with a brand. First impressions can’t be taken back, so it’s important to interact with interested consumers effectively – not damage your brand for future customers. Direct mail has been shown to be a great brand building tool. The piece can be touched and felt and it is not considered to be an intrusive interruption – it is desired communication. 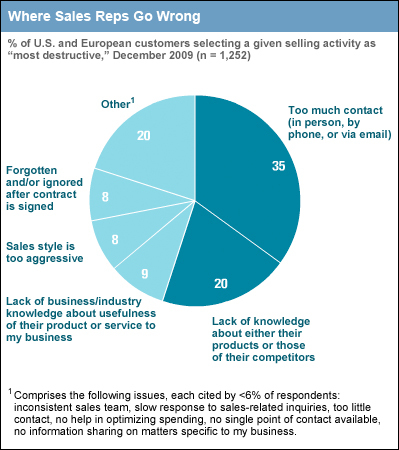 The Harvard Business Review featured some results from a McKinsey & Company study that found that the “most destructive” failures of business-to-business sales reps are too much contact with customers (35%). Customers want to be contacted, not bombarded. The upside of getting things right is significant: A primary supplier perceived as having a high-performing sales force can boost its share of a customer’s business by 8 to 15 percentage points. The methods of “bombardment” are in person, by phone or via email. Postal mail is not listed. Use direct mail to stay in touch with business customers without making them feel inundated. Dean's Mailing & List Services, Inc.